** VERY IMPORTANT ** Please disable Bonjour and update the firmware to v1.0.1.6. See images for instructions. 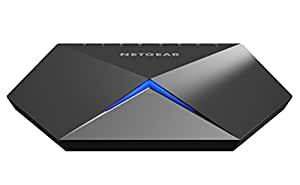 The NETGEAR Nighthawk(R) S8000 Gaming & Streaming 8-Port Advanced Gigabit Ethernet Switch is a versatile, ultra-performance, easily configurable network switch designed for expert gaming, 4K UHD media streaming, and basic home network connectivity. Its sleek and modern design make it the perfect for any modern home or small office. The Nighthawk S8000 brings low latency, traffic and port prioritization, and Quality of Service (QoS) management at the click of a button for ultra-high performance in high-demanding online/VR gaming and media streaming. The Nighthawk S8000 Gaming & Streaming Switch comes plug-and-play installation and an intuitive web browser-based user interface with “one-click” comprehensive prioritization presets and optimized settings for gaming, media streaming, standard networking, plus and additional two user-defined “one-touch” presets for total flexibility. The Nighthawk S8000 also comes with an industry-leading 3-year warranty, 90 days free technical phone support, and technical chat online support when purchased from an NETGEAR authorized reseller.